LENA -- More than 1,000 people from all walks of life came Thursday afternoon to pay their last respects to the late Julius Patrick Jr. Ministers, lawyers, engineers, average citizens and politicians filled the gymnasium at Northwood High School for services honoring Patrick, the Boyce mayor who was killed in an automobile accident Sunday. Donna Clark of Alexandria, a first cousin of Patrick's widow, Beatrice, said his death was hard to accept. "He was a very lovely, happy person. He was the kind of person who would help people," Clark said. District Attorney James "Jam" Downs and Assistant District Attorney Phillip Gremillion recalled that he was a "good" man. Downs said he served as Boyce city attorney for 15 years before becoming District Attorney, and Gremillion held the city attorney's position several years more. "He was a nice man. He would come by the (District Attorney's) office from time to time to get advice on something or just to talk," Downs said. Boyce resident Gerald Shepard recalled how Patrick served as mayor basically his whole life. "He's been my mayor since I was 12 years old," Shepard said. Patrick, who served as mayor 28 years, helped Shepard in "a lot of situations," he said. Officials from area city governments, including Alexandria and Pineville council members, attended the funeral. Police Juror Donald Wilmore, who represents the area including Boyce, said, "He and I worked together on many issues. He was a very intelligent man." Some people may not have realized that Patrick was principal of Reed Elementary and North Bayou Rapides schools while also serving as mayor, Wilmore said. "He would finish up at the school and then go do his mayor's duties. It made for a long day," he said. Six ministers participated in the funeral, and expressions of condolence were delivered by representatives of Gov. Kathleen Blanco's office, National Conference of Black Mayors, Louisiana Chapter of National Conference of Black Mayors and Louisiana Municipal Association. Burial was in Forest Lawn Cemetery in Pineville. Funeral service for the Honorable Mayor Julius Patrick, Jr., Town of Boyce, will be held at 1 p.m. on Thursday, November 30, 2006, at Northwood High School, Lena, Louisiana. The Rev. Joe S. Green will be officiating. 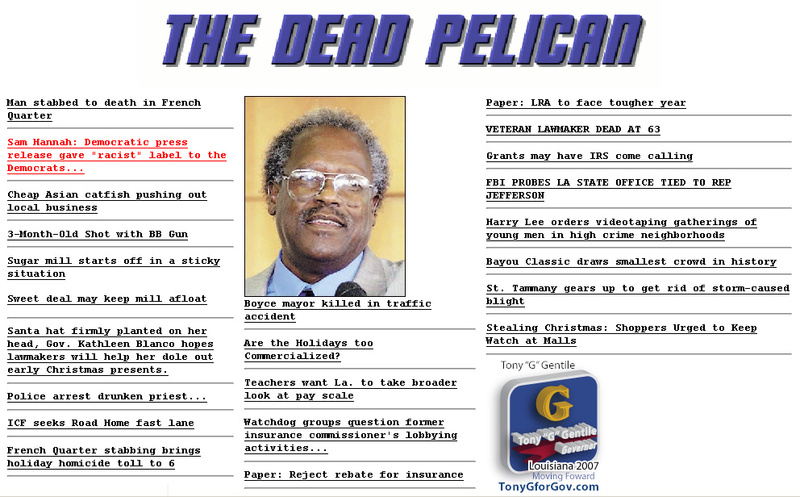 Mayor Patrick, age 68, died Sunday, November 26, 2006, in Ascension Parish. He was preceded in death by his parents, Julius Patrick Sr. and Ella Belle Wardsworth; Battles; two sisters, Helen S. McGaskey and Georgia Mayberry. He leaves to cherish his memories: his wife, Beatrice J. Patrick; one son, Ronald K. Patrick (Ann) of Garland, Texas; three daughters, Karen Patrick Jones (Ed) of Shreveport, Louisiana, DiAnthia L. Patrick of Fairfax, Virginia; and Riqui' J. Patrick of Silver Springs, Maryland; two grandchildren, Brennan M. Patrick and Kristen Y. Patrick; one brother, Major Williams of Natchitoches, Louisiana; numerous political and education colleagues; and a host of nieces and nephews, relatives and friends. Pallbearers will be members of Omega Psi Phi Fraternity and friends. Viewing will be Thursday, November 30, 2006, from 8 a.m. to 10:30 a.m. at Winnfield Funeral Home, 2033 Third St., Alexandria, Louisiana. Viewing will resume at 11:30 a.m. at Northwood High School and will continue until time of service. The motorist who allegedly started a chain-reaction accident that led to the death of Boyce Mayor Julius Patrick Jr. turned herself in to police today, Sgt. Markus Smith of State Police Troop A said. Mercuria J.S. Colomb, 28, of St. Rose was driving a car that turned into an SUV heading east, causing it to cross the Interstate 10 median, sideswipe a westbound oncoming car and then crash head-on into a car driven by Patrick, killing him instantly, police say. Patrick’s funeral is set for 1 p.m. Thursday at Northwood High School in Lena. The Rev. Joe Green will officiate. Classes at Northwood will be dismissed at 11:25 a.m., school officials said. Colomb turned herself into State Police and was booked into the Ascension Parish Detention Center. She is charged with negligent homicide, negligent injuring and improper lane usage. Smith said Colomb left the crash scene headed east on I-10. Although State Police had a description of the car and a license plate number, it was difficult to track because the owner’s address was listed at a New Orleans residence which was destroyed by Hurricane Katrina, Smith said. The driver of the SUV, Alona M. Williams, 20, of Baton Rouge, suffered serious injuries, he said. She was airlifted to a Baton Rouge hospital, Smith said. The driver of the other car, Scott M. Gilbert, 27, of Houston had minor injuries, but he was not taken to a hospital, Smith said. Viewing of Patrick will be from 8 to 10:30 a.m. Thursday at Winnfield Funeral Home in Alexandria, and then it will resume at 11:30 a.m. Thursday at Northwood High School and will continue until time of service. At 2:59 PM, on Sunday, November 26, 2006, State Police Troop A responded to a multiple vehicle crash that resulted in a fatality. The crash occurred on Interstate 10 westbound at milepost 189 in Ascension Parish. In the crash, a Beige Nissan Maxima, Louisiana license plate number OTE 951, was eastbound in the right lane of travel. The Nissan Maxima made a sudden movement and struck a Toyota 4Runner that was traveling in the eastbound left lane. The collision between the two vehicles forced the 4Runner across the median and into the westbound lanes of travel. Upon entering the westbound lanes of travel, the 4Runner clipped a 2003 Saab (westbound left lane), and crashed head-on into 2000 Mazda Millennium (westbound right lane). The Nissan Maxima left the crash scene traveling eastbound on Interstate 10. The driver of Mazda Millennium and Mayor of Boyce, LA, Julius Patrick, Jr. (B/M/Age 69), sustained fatal injuries and was pronounced dead at the scene by the Ascension Parish Coroners Office. The driver of the Toyota 4Runner, Alona M. Williams (B/F/Age 20) of Baton Rouge, LA, sustained serious injuries and was airlifted by Acadian AirMed to Our Lady of the Lake Hospital in Baton Rouge. The driver of Saab, Scott M. Gilbert (W/M/Age 27) of Houston, TX, sustained minor injuries, but was not transported. Currently troopers are working to locate the driver of the Nissan Maxima. 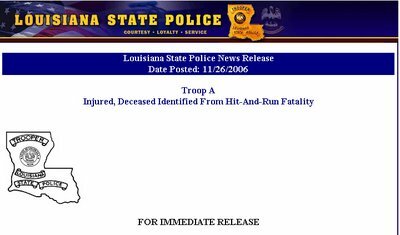 If there are any witnesses to this crash or if anyone saw the Nissan Maxima with the Louisiana license plate number OTE 951, State Police Troop A is asking that you contact 225.754.8500.
sad news this morning from the town talk (see link) via the dead pelican. 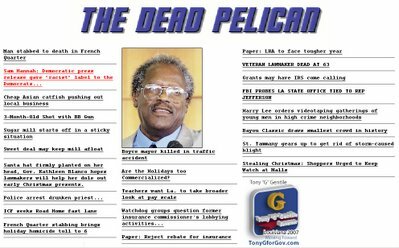 longtime boyce, louisiana mayor julius patrick was killed yesterday (sunday 26 november 2006) by what kalb.com's renee allen is describing as a "hit and run crash along interstate 10." mayor patrick recently won reelection. I was shocked to hear of the death of Boyce Mayor, Julius Partick. While many remember him for his political career, I will remember him as my high school science teacher. In the early 70's, at a time of forced school busing and high racial tension, Mr. Patrick came to Poland High School from Wettermark. Mr. Patrick was one of those type of teachers that they make movies about. He took great interest in his students, and was widely liked by all. I can remember his science class gave him a suprise birthday party, the size of which I do not recall for other teachers. We missed him when he was transfered from Poland, and he will be missed in this final transfer. its a start jeff crouere! will roseanne & tom arnold bury the hatchet? 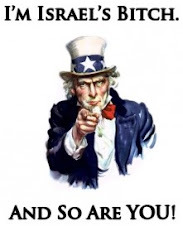 blow up the white house? so wheres the bush apology? emily metzgar is getting it!